Atub is an Orc sorceress living in Largashbur. She offers expert training in Illusion after completion of The Cursed Tribe quest. She wears hooded black mage robes and a pair of boots. She carries a leveled dagger (either steel or Orcish), and also a Northwatch captain's key. She knows the spells Oakflesh, Ice Spike, and Fast Healing. Ugor: (addressing the player) "Halt! You have no business here, outsider. Leave at once." If Ugor is killed during the giant attack that will occur on your first visit to Largashbur, Atub can often be found standing on the guard tower next to the entrance gate. See The Cursed Tribe quest. 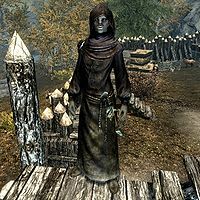 Atub was apparently intended to be an apothecary merchant. However, she does not buy or sell goods. The factions (JobApothecaryFaction; JobMerchantFaction) enabling her to do so have the wrong settings. This cannot be corrected by using console commands to add her to the two factions, as she is already a member of both; the problem is that her faction rank in each is set to 0, not 1. She also was incorrectly set to never leave her longhouse and visit her local alchemy shack. She is incorrectly assigned a Northwatch Captain's Key, which is also found in Northwatch Keep.